Ever since the “Big Three” entered the NASCAR lexicon in June, the obvious question has been: Which driver is the fourth? After all, having a four-man championship race requires more than just a Big Three. Brad Keselowski won the Southern 500 last week, but just one race is nothing to get too excited about when it comes to championship contention. He hadn’t even won all year before Darlington. But now Keselowski has won two in a row — and two of the biggest races of the season, at that — which makes him a lot harder to ignore entering the playoffs. When you combine Keselowski’s knack for managing the elimination system with his team’s ability to capitalize on opportunities like it has the last two weeks, that could be dangerous even for rivals who have more raw speed. As we all know, the fastest car doesn’t always win in NASCAR — and the fastest four cars definitely don’t always make it to Homestead. Keselowski suddenly has the fourth-most playoff points (19), and I’d hate to be a driver having to beat him in a must-win situation. Momentum is real in racing. So I’ve seen enough to pick Keselowski as my fourth playoff driver for Homestead (my complete predictions are in Item No. 5). This may very well have been the last unrestricted Brickyard 400 for the foreseeable future. So it’s fitting it ended with a classic, NASCAR-style finish. On a restart with three laps to go, Clint Bowyer spun the tires and opened the door for Keselowski to challenge Denny Hamlin for the race lead. Despite Keselowski having fresher tires, he had to use every move in his driver bag of tricks to get by Hamlin as they were coming to the white flag. What we saw were two drivers going all out and doing everything they could while operating at their peak talent level in order to win. It was the kind of moment that makes NASCAR so special. But that’s likely going away soon. The All-Star aero package (or whatever your name for it is) was used in the Xfinity race earlier Monday, and you get the feeling most fans would say they preferred that racing over the Brickyard 400 itself. NASCAR reportedly wants to run that package in up to 14 Cup races next year, and the Brickyard will certainly be one of them. And it works better here than other places. At the same time, that is going to be tough to swallow. The idea of the Brickyard 400 — even with stages and competition cautions and the like — still has a purity. It’s the best stock car racers on the planet pushing themselves to the absolute limit and forcing their equipment to race on the edge of disaster. The best drivers often win the battle. That might be the case in the future as well, but it will be more of a coincidence. Pack racing and drafting takes a different skill set, and it doesn’t take the same incredible talent to just run wide open around a 2.5-mile course. So I’ll miss Cup races like today’s, even if it was boring at times compared to the Xfinity race. Because when it was all said and done, it felt more like real racing than what the future appears to hold. Hey, did you notice NASCAR held two races without a single practice or qualifying lap on Monday — and had no problems whatsoever? No one has dared to start a Cup race without some laps on the track since I can remember (2004 until now), although the weather has always allowed for some on-track activity before the race. It turned out just fine, though. The drivers and engineers don’t need practice. They honestly don’t even need qualifying. This proves NASCAR could easily do a one-day show if it wanted to. Show up to a track on a Wednesday night, give teams a 30-minute shakedown practice at 2 p.m., qualify at 4 p.m. and race at 7 p.m. It would be a great event and probably wouldn’t turn out any different if it was a three-day weekend with four hours of practice. Officials should at least try it a couple times to see if it can work. After Indy, it seems like it would be an easy way to condense the season schedule without actually losing any races. As the playoffs begin, we bid farewell to the once-promising seasons of several drivers. Jamie McMurray had made the playoffs for three straight seasons and everyone figured his consistency would get him back again this year. Instead, he finished the regular season ranked 21st in points and had news of his imminent departure from a full-time ride at Chip Ganassi Racing reported before Monday’s race. Daniel Suarez, who finished the regular season 20th in the standings, was unable to capitalize on the great speed shown by Joe Gibbs Racing almost all season long. His three teammates made the playoffs while he did not. Meanwhile, reports have Truex replacing Suarez in what is currently the No. 19 car next season. Then there’s Ryan Newman, who has made the playoffs seven times but was the first driver out this season. His future at Richard Childress Racing is in doubt as well. Paul Menard couldn’t make the playoffs in his first season at Wood Brothers Racing, although Ryan Blaney did it in the same ride last year. And William Byron missed the playoffs in his rookie year as his three Hendrick Motorsports teammates all got through (albeit taking two of the last three spots). I recorded a preseason playoff predictions podcast with Bubba Wallace in January. The results: I got 13 of the 16 drivers (I had Newman, McMurray and Byron instead of Austin Dillon, Alex Bowman and Aric Almirola) and Wallace got 12 correct (he had Newman, McMurray, Ricky Stenhouse Jr. and himself instead of Almirola, Bowman, Kurt Busch and Clint Bowyer). So I’m not exactly that great at predictions, but I’ll try again anyway for the playoffs. In the first round, it will be Dillon, Bowman, Blaney and Jones getting eliminated. In Round 2, Johnson’s shot at Championship No. 8 will end, along with Almirola, Kurt Busch and Logano. When it gets down to the final eight drivers, it will be a shocking elimination for Truex, along with Bowyer, Hamlin and Larson. Then it will come down to the final four: Kyle Busch, Harvick, Keselowski and Elliott — with Harvick winning his second title over Busch. Five NASCAR playoff drivers (Aric Almirola, Kyle Larson, Joey Logano, Martin Truex Jr. and Denny Hamlin), along with @nascarcasm and Paige Keselowski, join me on the frontstretch at Indianapolis Motor Speedway to help break down the upcoming NASCAR playoffs. A few hours before the race, Rick Hendrick sat in the media center for a news conference and deflected questions about Kasey Kahne’s future. It wasn’t exactly a vote of confidence for the driver of the No. 5 car. A potential replacement for Kahne — William Byron — had kissed the bricks a day earlier. Kahne, meanwhile, hadn’t won in nearly three years and entered Sunday 22nd in the series standings. His future didn’t exactly seem bright. But after catching a lucky break on pit road and inheriting the race lead, Kahne found himself racing for his career — and delivered. By excelling on two key restarts — one in which he held it wide open in the middle of a three-wide battle with Jimmie Johnson and Brad Keselowski; another in which he out-dueled race leader Keselowski in overtime — Kahne reminded everyone of his talent. After all, the guy has now won 18 career Cup races (ninth among active drivers), so that ability is there somewhere. It’s just been buried under a lack of confidence in himself and his team, a snowball effect that’s only gotten worse in the last couple years. There’s no doubt he’s been mired in a terrible situation and could use a change of scenery despite having a contract through next season. But where could he land if he does part ways with Hendrick? Well, winning the Brickyard and getting himself into the playoffs will do wonders for his prospects. He remains a popular driver despite his struggles, and now he won’t be an afterthought when it comes to top candidates to fill an open seat. NASCAR has an overtime rule, the point of which is to try and give fans a finish under green. But it appeared officials basically used the rule to make sure the race finished under yellow — and thus ended — on Sunday. That’s the second time in a month this has happened, and it’s a disturbing trend in my view. Darkness was quickly falling and there had been multiple big wrecks and long red flags. So when Denny Hamlin and others crashed on the backstretch, NASCAR waited to put out the caution until Kahne had crossed the overtime line (thus making it an official attempt). 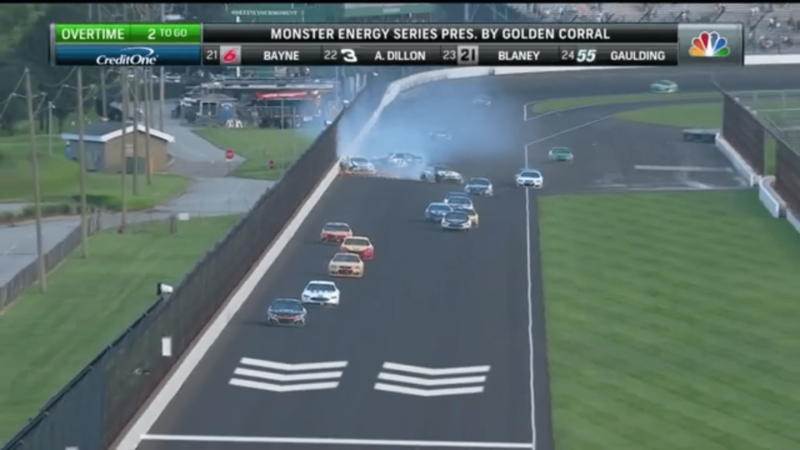 In this screenshot, you can see the wreck has started to take place (actually for a couple seconds at this point) and there’s still quite a ways before Kahne reaches the overtime line (the white line at the bottom). NASCAR could have called a caution there, but they would have had to clean the track and might not have gotten the race restarted before it got dark (maybe, maybe not). So Kahne might have won anyway. But here’s the thing: That’s not the rule! Whether it was dark or not shouldn’t have mattered at all. If it was dark, then let THAT end the race (like a rain-shortened event) instead of using the overtime line to do it. NASCAR’s explanation for not calling the caution is it officiates the end of the race differently in hopes of getting a finish. That logic doesn’t hold, though, because it wasn’t the end of the race. If it was the white flag lap, then sure. I get it and we’ve seen that plenty of times. But just like in the Daytona Xfinity race (where there was pressure to get it over with and move on with a doubleheader race day), the overtime line shouldn’t be used as an out. At this point, I’ve come full circle and given up on any kind of overtime rule. Just forget the whole thing and go back to finishing races at the scheduled distance if the rule isn’t going to be used as intended. Much ado was made of the restart when Kyle Busch and Martin Truex Jr. collided while racing for the lead, moments after Busch had nixed a deal the drivers had kept all race. Truex and crew chief Cole Pearn were miffed Busch wanted to race for it after Truex had played the good Toyota teammate in the first two segments. That may have played into how hard Truex raced Busch into the corner, but it was also likely because both drivers knew it might have been their final chance to get the lead (even though there was still more than one-quarter of the race remaining). For that very reason, Busch didn’t even want to wait until the restart in question. On the prior caution (the break after Stage 2), he was in the midst of a conversation with crew chief Adam Stevens about what to do when NBC suddenly interrupted to talk to Stevens. The driver and crew chief never had a chance to address the issue again until the next restart — when Busch called off the agreement. So even though scrapping the deal ultimately resulted in a crash, Busch shook his head when I asked if he had any regrets. Did you notice? Matt DiBenedetto, who is sort of the ultimate underdog with his GoFAS Racing No. 32 car, scored an eighth-place finish after surviving all the insanity on Sunday. Incredibly, DiBenedetto is one of four drivers — Kahne, Joey Logano and AJ Allmendinger are the others — to score top-10 finishes in both the Daytona 500 and Brickyard 400 this year. Not bad for a team with only 15 employees. I’m going to be totally honest with you: I was on the verge of tears at one point during the rain delay on Sunday. Spending my own money to get to races this year has really provided some additional perspective on what fans who travel from out of state go through each weekend. Back when I was at USA Today, a rained-out race meant a lost day at home (which sucked). But at least I didn’t have to spend my own money to pay an airline change fee or extra day of rental car/hotel/etc. That was on the company’s dime. Now, though, that money is coming out of my pocket. And though my amazing supporters through Patreon have put me in a great position to get to races this season, spending extra money just isn’t in the budget. So I’m pretty sure I would have had to go home instead of changing my flight to attend a postponed race. Because of that, it was incredibly frustrating when there was no rain at 1 p.m. (when NASCAR races traditionally start) and the skies were dry until 3 p.m. NASCAR could have gotten a couple stages in during that time, which would have meant an official race. And while a shortened race wouldn’t have been ideal, it would have been a lot better for fans who spent their hard-earned money to travel there without flexibility in their plans. Luckily for everyone, the race eventually finished on Sunday. But there was about an hour there where another big storm cell had formed and was heading right for the track — and if it had hit, that would have meant a Monday race. I was seriously sweating that scenario. At some point, NASCAR isn’t going to be so fortunate. A late start time in the name of better TV ratings will force a postponement when the race could have gotten in had it started earlier — and a lot of fans will have to either eat their tickets or spend money to change their plans. And when that happens, they’ll have every right to be pissed. Former FOXSports.com writer Tom Jensen — now of PopularSpeed.com — joins me along with his son, John, to break down the wild, wacky and controversial Brickyard 400 at Indianapolis. I’m playing DraftKings this season and will be posting my picks here each week. Disclosure: If you want to play and sign up using this link, DraftKings will give my website a commission. Last race’s results: Played $4 Brake Pad contest and finished 1,560th out of 5,400. Won $8. Season results: $55 wagered, $72 won in 15 contests. This week’s contest: $9 Track Record game ($400k in total payout). — Kyle Busch ($10,500): The polesitter and two-time defending champion is likely going to lead a bunch of laps. It’s hard to go against his hammer possibilities, even though he’ll lose points in place differential if he doesn’t win. — Kyle Larson ($10,200): Larson struggled on Saturday by his standards and had his worst qualifying effort of the season, so he’ll start 25th. The thing is, you know his cars have speed (look at the team’s usual performance, along with teammate Jamie McMurray qualifying third) — which means Larson will probably still get a top-10 out of it and get you a bunch of place differential points along the way. — Dale Earnhardt Jr. ($8,200): Earnhardt seemed to have a car better than the 13th-fastest qualifier, which means he could pick up some positions. It wouldn’t be surprising to see him get a top five at Indy given the Hendrick speed overall, and he’s relatively affordable for someone with that potential. — Kasey Kahne ($7,900): It’s scary to pick Kahne these days, because something always seems to go wrong and screw up his race. But he seems to have a fast car at Indy — he had the sixth-fastest average of the 12 cars who did at least 10 laps in final practice — so it might be worth taking a chance on a guy who starts 19th and could pick up some place differential points. — AJ Allmendinger ($6,900): It doesn’t look like he has a very good car this weekend, but he qualified 40th. So if he gets a top-25 finish at all, that’s 15 points right there in place differential — which is a way better deal than you’re going to get with other drivers in this price range. — Paul Menard ($6,300): Here’s a former Brickyard 400 winner who starts 17th and is available for a good price. Menard has consistently made good runs at Indy — he has six top-15 finishes in his last seven Indy races.